It’s a mixed bag this week, friends. This is the calm before the storm, I suppose, here on the cusp of yet another fall star party season. That begins for me in a couple of weeks with the legendary Peach State Star Gaze. I’m sure looking forward to observing and speaking at that one, since I haven’t been to a PSSG in over a dozen years, not since the event was at its former home in Copperhill, Tennessee. I have high hopes for the current venue, the Deerlick Astronomy Village, which is not only much closer to me, but is, I suspect, darker than the old site was. Next on the calendar after Peach State is our “home" star party, the Deep South Regional Stargaze, now, almost unbelievably, in its 33rd edition. Rain or shine, we return to this one every single year like swallows to Capistrano. I’ve missed exactly one Deep South since 1993, that was due to work, and I am still mad about it. 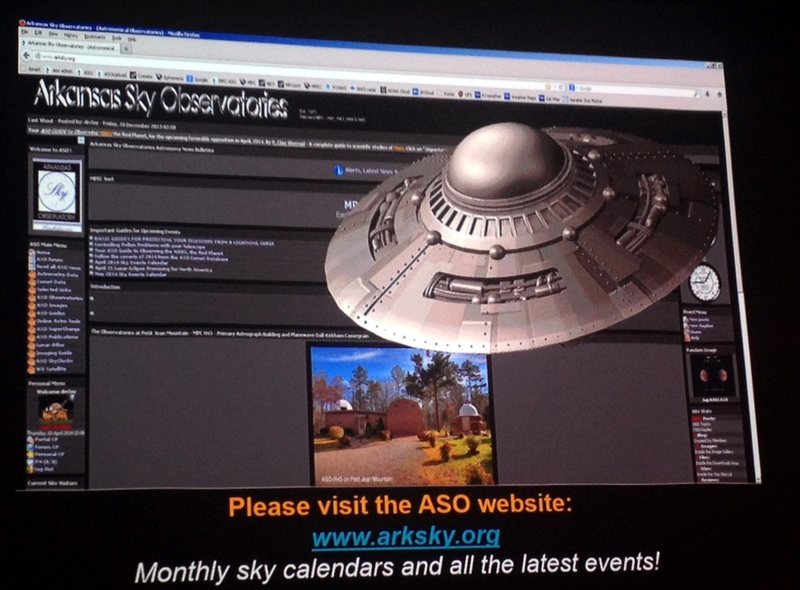 I’ll wrap things up for fall the week after DSRSG with the brand new Chiefland Star Party. Those of you who have visited the Chiefland Astronomy Village will not be surprised to learn that the star party—which, in its renewed form is, I believe, gonna be big—is somewhat video-centric, but “video,” or maybe more properly “electronically enhanced observing,” covers a lot of territory and a lot of methods these days. Anyhow, no matter how you observe, you will be more than welcome at this new event. And so it was. We were picked up at the motel by PAS President (and DSRSG Managing Director) Barry Simon, taken to the venue at the University of New Orleans, and, after the meeting wound up, conveyed to the excellent Bobby Hebert’s Cajun Cannon for fun and food after. The talk? While it was a new one, “Amateur Astronomy the Old Fashioned Way,” which I’d only given once before at this year’s AHSP, it went smoothly and my audience seemed to enjoy it. All in all a great experience and one I’d be happy to repeat. Next on my agenda, on this past Wednesday, was getting a C8 ready to sell. Why am I selling one of my beloved 8-inch SCTs? There are several reasons, personal and practical, but one important one is that I have come to hate the idea of equipment sitting around unused. This particular C8 and the CG5 mount I have it on, which I am also selling, could be making a young amateur or a cash-strapped amateur happy instead of just collecting dust sitting on the floor of my shop. I’d tested my CG5 week before last and given it a clean bill of health; now it was time to look at that old OTA. The C8 in question came to me for basically nothing since it was a problem case. As is not unusual for older scopes, the primary cell was loose in the corrector. So loose that it was difficult to collimate; when you tried to adjust a screw, the whole secondary rotated. If this were a Meade, it would have been easy to fix. Just remove corrector and tighten the secondary baffle, which screws onto the secondary housing and holds it in place against the corrector plate. 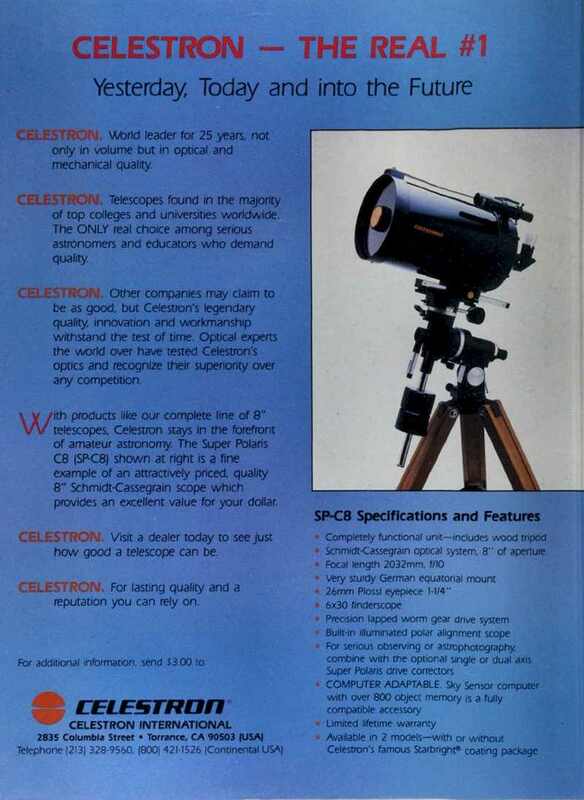 Unfortunately, Celestron has usually glued rather than screwed the baffle in place, and that was certainly the case with this 1987 vintage OTA (originally a Super Polaris C8). I removed the corrector and gave the baffle an experimental twist while holding onto the secondary housing. Didn’t even begin to budge. You can read the full story here, but the gist is that I put corrector/secondary in the freezer and after several freezing/warming cycles was able to break the baffle free and re-glue it. After the repair, I used the scope to shoot some pictures of C8 disassembly for my book Choosing and Using a New CAT, and that was it for the poor old thing. I did take it to a couple of public outreach events, but I eventually put it in a case and forgot about it. So, I resolved the C8 like the CG5 needed to go. I didn’t and don’t intend to give the pair away, but I settled on a reasonable price, if not quite as reasonable as I’d hoped. The OTA lacked the Vixen dovetail it needed for mounting on the CG5 (the original SP dovetail rig had disappeared long before the scope came to me). Unfortunately, it appeared my sources of inexpensive dovetail brackets had dried up. Best price I could get was on one from ADM for around 80 bucks shipped. But that was a good thing. Their gear is top notch and when I received the beautifully machined thing, it was the job of a mere five minutes to install it. I’ve had cheaply made dovetails that required not just furnishing my own mounting screws (everything is included with the ADM), but elongating screw holes with a drill, etc., etc. My backyard outing had one more purpose: I wanted to check out Synta’s latest firmware for the Atlas EQ6, v3.37. I’d loaded it up some weeks before but hadn’t had a chance to test it under the stars. I was curious to see if it would work correctly, since some users had reported serious problems when using it with early mounts (my Atlas is eight years old). When darkness fell, I was ready to go. I’d mounted the old C8 on the Atlas earlier, and I had to admit the result looked very nice. Flipped on the mount’s power, and immediately received the double beep that spells trouble along with a warning message, “Caution, alt/dec, no response.” Annoying, sure, but the message had no effect on operation. Either continuing past it to the setup menu with Enter, or just cycling the power got me going. I assume this minor incompatibility comes from the firmware needing to work with the newer alt/az-EQ Synscan mounts. Anyhow, the accuracy of gotos and the built-in “AllStar” polar alignment routine was very good. It’s still wise to reject alignment stars the HC suggests that are lower than 30-degrees, but usually just accepting those offered by the HC is now good enough. The mount reliably placed anything from one side of the sky to the other in the field of my 13mm Ethos at f/10 (156X). That is more than adequate for a mount I use only for the prime focus imaging of a few targets a night—no 100 object Mallincam runs. The telescope? I pointed at Polaris and checked the collimation. A little out. I spent more time than I should have tweaking it in, but I haven’t done much collimating recently; my scopes just haven’t needed it. Otherwise? Despite its Halley’s Comet era vintage, the telescope presented good images. The focus is nice and easy as is the norm with Celestrons of that era, and I prefer it to the stiffer focus feel of modern OTAs. It has some other nice features, too. Its built in piggyback camera mount is cool, and the wacky flexible plastic handle actually makes it easier to mount the telescope a GEM. The excellent appearance of the large handful of DSOs I observed before mosquitoes drove me inside to view Fear the Walking Dead on on-demand almost made me reluctant to sell the old warhorse. The next night, since the C8 and Atlas EQ6 were still set up in the backyard, I decided I might do some more short-sub imaging, but maybe kick things up a notch. Yes, you can get nice subs of brighter objects at 15 - 30-seconds, but they will never result in final pictures that look as smooth and dense as what you can get with longer sub-frames. A stack of 20 90-second shots will always beat a stack of 50 20-second ones. The only problem there? The Atlas is a fine mount given its modest price. Its goto with the latest iteration of the SynScan firmware is, as above, quite good and its tracking is sweet for such an inexpensive GEM. Still, at a minute of exposure you will begin throwing out frames at 1300 – 1400mm of focal length. Especially if, like me, you don’t like doing drift polar alignments. Bottom line? This is the point where you gotta guide. But as I said some time back, if you keep exposure and focal length at reasonable values, guiding doesn’t have to be tough; it can actually be easy to do. 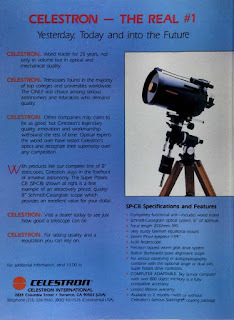 For me, "easy" is spelled “mini-guide-scope.” You know, one of Orion’s (or KW Telescope's) 50mm guide scopes, which are essentially modified finders. I intended to couple that with my good old Orion StarShoot auto-guider camera. This monochrome CMOS cam is not exactly sensitive, and it is hopeless in an off-axis-guider, but in the 50mm guidescope it does get the job done. The wide field of the 50mm guide scope means you always have several good guide star candidates in the field. I mounted the mini-guider on the C8, my old 1995 Ultima OTA, Celeste on this evening. I changed out OTAs simply because Celeste is set up for a JMI Motofocus, which makes getting bang-on focus simple. She’s also got the requisite mounting base for the Orion mini-guider, which the SPC8 OTA does not. So, I was all set. Oughta be simple. Hah! It never is with me. The first problem was the old (and cheap) prime focus adapter I was using. The threads were rough and coarse, and it was tough to get the camera screwed onto the 6.3 reducer corrector. In the course of trying to get the Canon tight enough so it would not rotate on its own, I managed to unthread the adapter ring that is screwed onto the end of the baffle tube on a C8. This threaded ring forms the telescope’s rear port to which you attach diagonals, visual backs, camera adapters, and everything else and is normally never, ever removed from the scope. Well, it sure was removed now, threaded up inside the reducer/corrector and absolutely impossible to unscrew from it. What to do? Nothing for it. I shut down the mount, removed the scope from the saddle, and carried it into the Sun Room. There, by screwing the now combined reducer and the rear-port ring back onto the C8 and tightening them down like the Incredible Hulk, I was finally able to undo the reducer/corrector while leaving the adapter ring in place. To prevent a recurrence, I added a little lube to the r/c’s threads. If I have further problems with the adapter ring, I’ll apply Loctite, but I believe it is OK now. One smart thing I did the first thing the next morning was order a new SCT prime focus adapter. I do try to learn from my foul-ups. I was now hot and bothered even in the cool October air, but I managed to get the C8 back on the Atlas and realign the mount. My problems were not quite over yet, though. In the process of getting the laptop working, I obviously did a Bad Thing. What, I don’t know exactly, but it required a reboot of the computer, which then, NATURALLY, decided it wanted to spend ten minutes updating—and I thought that was not supposed to happen with Windows 10. Sigh. Once everything was finally squared away, I was frankly weary about ready to throw in the old towel, but I wanted to at least see how well the latest rev of the fantastic PHD2 would guide the Atlas. Where to start? The sky, which had begun the evening cloudy, cleared, clouded over again, and then cleared once more, somewhat anyway, didn’t look promising. Have to be something bright. M13 was getting low as 10 p.m. approached, but it would be good enough, I thought. Two things that gave me no trouble on this night? PHD2 and the Atlas. I got the guide program running, clicked on one of the stars the StarShoot picked up, and PHD calibrated and just guided. As always, it simply locked on and I had no occasion to worry about trailed stars in my 90-second exposures. I settled on 90-seconds as a means of checking the guide quality of PHD, but that was actually on the long side given the light scatter from increasing haze and the presence of a rising gibbous Moon in the east. I could tell the subs appearing on my screen were at least OK, if not as good as the shorter ones I’d done with the C11 the week before last. The sky was just too nasty on this evening and M13 just too low. 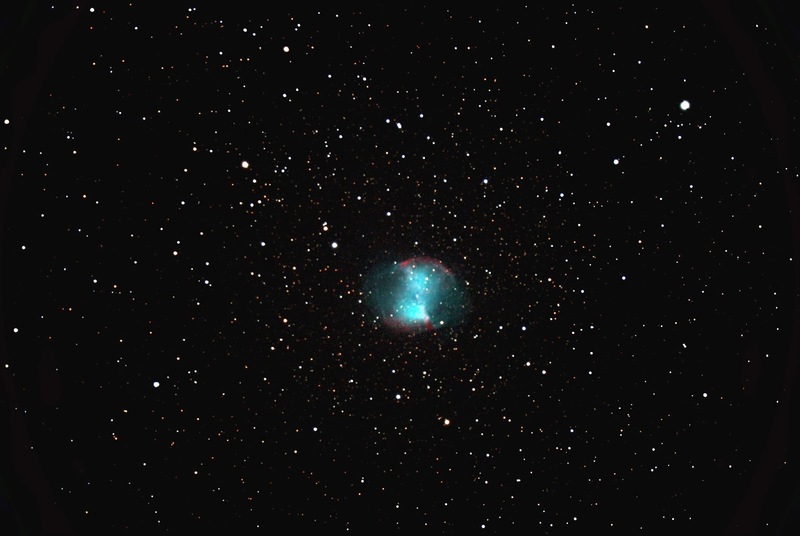 After the sequence (which I did with Nebulosity 3, natch) finished, I went on to M27, which was still good and high, and fired off twenty more 90-second subs. While they looked better than those of M13, they still weren’t much. The sky was getting worse and worse and the Moon higher and higher. I still intended to do one more after the Dumbbell, maybe M15, but there really wasn’t much point to it. The sky had now gone south in a big way and I’d already done what I’d intended to do, further check the Atlas’ firmware and also test the new PHD release. It was, honestly, time to pull that Big Switch. I was still reluctant to do so since the sky was still semi-clear, but in the end the decision was made for me when the Canon’s battery died. I parked the Atlas and headed inside. The next morning, I set to work on the subs. While the longer exposures made them easier to process in some ways, the gradients caused by the light pollution/haze and the Moon added to the difficulty of processing and were made worse by longer subs. As always, “TANSTAAFL.” When I finished, though, I had to admit that the results I’d got on such a punk evening were probably better I could have gotten with unguided 15 – 30-second subs under the same conditions. Last but not least? 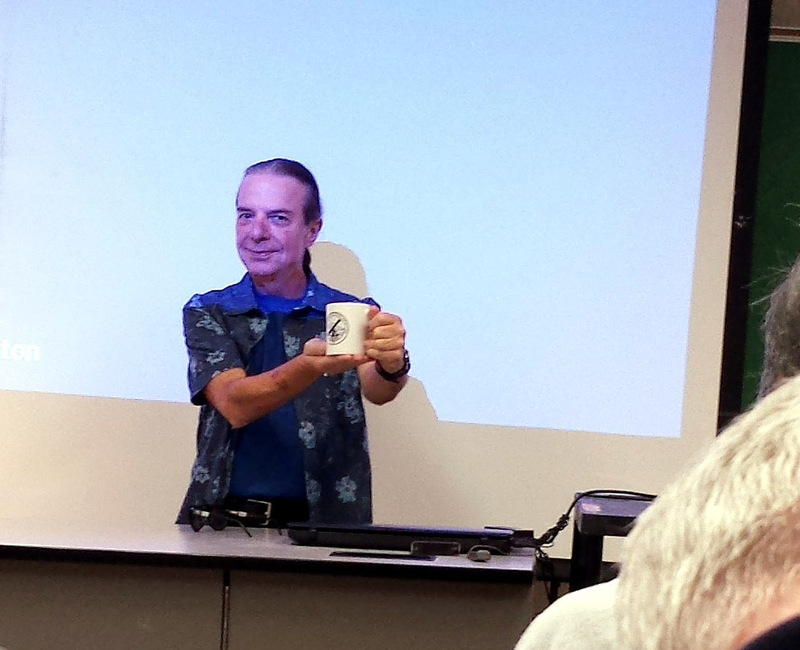 An unvarying fixture of our autumn each year is visiting Pensacola, Florida and the Escambia Amateur Astronomers’ Association for my old friend “Doc” Clay (Mr. Meade, Mr. LX200, Mr. Arkansas Sky Observatory) Sherrod’s annual lecture. Not only was this year's talk, "UFOs: The Phenomenon," very interesting, it was great to spend a little time with Clay and wife Patsy. The venue at Pensacola State College was excellent, the audience enthusiastic, and the EAAA members out-of-their-way friendly to us visiting amateurs. Doesn't get much better. And that was it...that was the week that was. How was yours? And where will the scope for sale be posted? Thanks! Finding your blog has been a great thing. Reading your stories has helped rekindle my interest in stargazing and helped to make me make more effort to get out under the stars. Reading your stories has in part helped to give me the impetus to make more effort to use the wonderful equipment that I am fortunate enough to have, but not using to anywhere near their potential. My own potential is being revealed more now that I am making/taking more time to do this stuff, and your weekly stories have helped me overcome inertia and get out and do it. My week was notable for two things: my son's proposal to his lovely girlfriend was accepted, so we are celebrating our firstborn's good fortune with Miss Alex, to follow your lead. The second thing, while not as momentous, was very satisfying as well: the arrival of the equatorial platform made by Gregg Blandin for me for my 12" LightBridge. I haven't had a chance to use it but on my deck under city skies, but it is a pretty nice luxury to have. I can only hope that Miss Alex and my son have as longlasting a partnership as the lifespan of all of our finely crafted optical and mechanical instruments. So, my week has been pretty good. I look forward to reading about your week and weeks to come, as well as learning more useful and inspiring ideas from your weeks gone by. Thanks for sharing. You can certainly choose not to put this on the comment page--I just wanted to let you know that reading your collected musings has helped me get remotivated to get out under the stars.